We’d love your help. Let us know what’s wrong with this preview of Mom Enough by Tony Reinke. Are you mom enough? The cover of a popular magazine asked this haunting question in bold red letters that hung over the startling image of a young mother nursing her four-year-old. When the issue hit newsstands, it re-ignited a longstanding mommy war in American culture. But it turns out this was the wrong question, pointing in the wrong direction. There is a higher and mo Are you mom enough? The cover of a popular magazine asked this haunting question in bold red letters that hung over the startling image of a young mother nursing her four-year-old. When the issue hit newsstands, it re-ignited a longstanding mommy war in American culture. But it turns out this was the wrong question, pointing in the wrong direction. There is a higher and more essential question faced by mothers: Is he God enough? To ask other readers questions about Mom Enough, please sign up. Wonderful! Loved it! Definitely a book to reread through the years. I really really enjoyed this book. Everything from the short chapter length that gets right to the point to the variety of topics really spoke to my heart. I will re-read this one for sure! One of the only books I never hesitated to give a full 5 stars to. Are you a mom? Wanting to become a mom? Do you have a mom? Do you love Jesus? Read.this.book! This is definitely getting a privileged place of permanency on my nightstand. I very rarely underline in books, but I got up from my chair to search for a pen while reading this one. Lectura indispensable para todas las mamás cristianas. Palabras de alivio, aliento y que te retan a cambiar de mentalidad. La maternidad como un llamado de Dios. Recommend to all moms. To anyone who has a mom. To anyone thinking about becoming a mom. Excellent collection of blog posts on motherhood from the Desiring God web site. I felt challenged, convicted, and uplifted reading these. It's good to be reminded that my child's heart is the most important mission field I'll ever have. I was rattled by Carolyn McCulley's piece. She connected the decline in respect for motherhood to Darwin's view of women being less than men, and how that view directly led to a rise in abortions (thanks in no small part to Margaret Sanger). In today's culture o Excellent collection of blog posts on motherhood from the Desiring God web site. I felt challenged, convicted, and uplifted reading these. It's good to be reminded that my child's heart is the most important mission field I'll ever have. 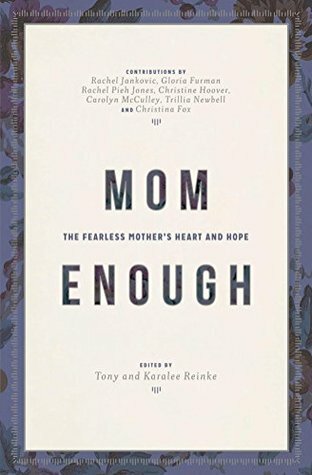 Through a variety of voices mom's will find encouragement in "Mom Enough". The short chapters are each individually published blog posts that have since been compiled. Reading from the perspectives of each author, I found much to relate to in my own walk with the Lord as a mom. I enjoyed reading it on my Kindle during the night, awake with my little one. I also found plenty to highlight, that I'll surely reference in the future. This little book is the perfect complementary devotional for busy moms everywhere. The chapters are blog posts adapted to print, each a digestible chunk of reading yet still full of depth and scriptural application. Incredibly good... Encouraging. Biblical. Practical. I will return to this one again and again. This book is a must-have for every momma. From here on out, I will be buying this book for every baby shower I attend. Each chapter is only 1-2 pgs along (perfect length!) and full of gospel truth to refresh a momma's soul and heart. Buy this book. You will not regret it. I promise. An extraordinary testament to the importance of motherhood. Some of the stories in this book will make you cry and others will lead you to serious reflection. It is truly refreshing to read something that affirms the pivotal role of women in a household. I found this book to be incredibly encouraging while at the same time incredibly convicting. I highly recommend it to all momma! I read this as I love Rachel Pieh Jones' blog. While my kids are nearly grown. I do not do daily parenting. I am not done being a mom. I was challenged in how I pray for my kids. I was challenged in remembering that the kids are God's and not mine. I love the varied perspective in the book as the authors of the book live in the US and outside the US. Incredible! Every chapter is filled with truth, encouragement and Gospel reminders. The short chapter length allows busy moms to read something during the craziness of the day but always leaves you with something to chew on! What a fantastic book! A must-read for all Christians mamas! Lots of very good "death by living" thoughts for mamas here. The essays by Rachel Jankovic are the best writing I've ever seen from her. Really, really good. Not just for moms - dads, you should read this too. This is an incredible book that encourages, strengthens and lifts moms up. It directly relates the gospel to motherhood and how we are called to live out Christ's sacrifice in our own homes. Mom Enough touches on everyday sacrifice, keeping eternity is mind, the comparison wars we play with other moms, common idols and relying on God every second of the day. It has helped me as a new mom immensely and I highly recommend it to all! I found this to be a fairly easy read; the short chapters made it easy to finish in between helping my littles. I was a little disappointed by the “Mom Wars” chapters... but otherwise, I was really encouraged and convicted throughout this book! The gospel message is clear - that we don’t need to do more or be more as mothers, but rather that we need Jesus more. However, this book felt very directed to stay at home moms, taking on the assumption that being in the home is THE way of the Christian mother which made the book feel less relevant for me. So inspiring and filled with wisdom. I've copied out numerous quotes. Truths that speak deeply to my heart: "Lay down pettiness. Lay down fussiness. Lay down resentment about the dishes, about the laundry, about how no one knows how hard you work. Stop clinging to yourself and cling to the cross." Ouch! Edifying, convicting and yet encouraging. "A-M-A-Z-I-N-G book... I so much needed to read such truths right now in the midst of the raising of two little girls.. "our children are not tasks to complete, but gifts to enjoy"... can I do that in the everyday rush?" Love love LOVE this bk. Gospel centered and funny and challenging. This is a book filled with articles that speak to the challenges of a mom’s heart. I think it would be wise for me to read this book again and again, as the challenges and seasons change. Tony Reinke hosts the popular Ask Pastor John podcast and serves as the Communications Director for desiringGod.org. He has authored five books including *12 Ways Your Phone Is Changing You* (2017). He lives in the Twin Cities with his wife and their three children.